Hello everyone! I hope you're all having a good week so far, when you guys read this I will be on my family holiday. I wanted to make sure you all had some posts to read while I'm away and plus I have so many exciting things to share with you at the moment I don't want to waste any time! Amongst having a desire for all things beauty related I've always had a weakness for perfume! 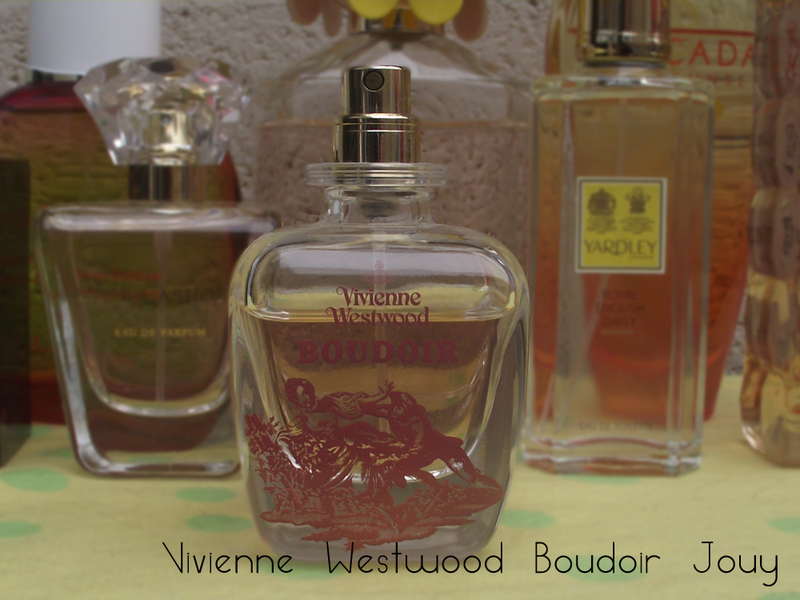 I adore perfumes, the intricate styling and design of the bottle right down to how the scent lingers on your skin. 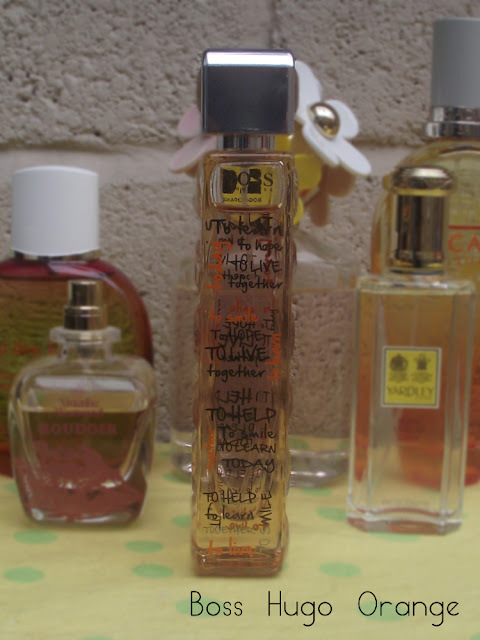 I wanted to show you my top scents for the Summer. I actually struggled and did actually take 3 perfumes away because I thought this was a little too much, and yes some of you will think this is wayyyyy too much BUT like some women adore shoes or handbags I adore perfume. 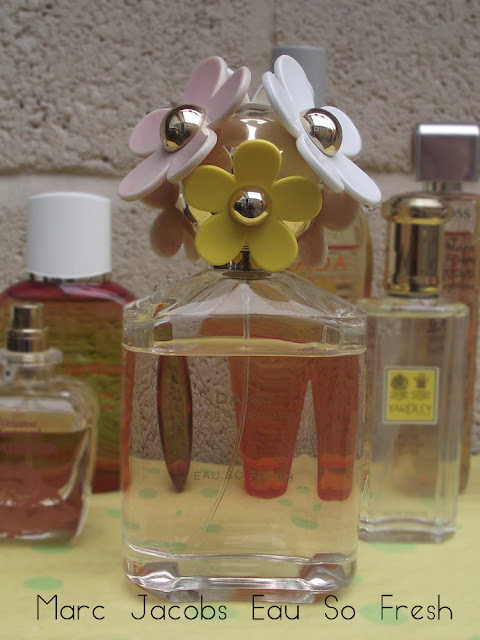 To start off my top Summer Scents I had to feature the very chic Marc Jacobs Daisy- Eau So Fresh first. The bottle not only looks amazing on your dressing table it also smells amazing, a mix of a fruity floral. This would make a great wedding day fragrance, I know for sure when I get through my bottle I will be repurchasing! Next up is a new scent to my perfume community, but it still makes the cut because it's a great summer scent. Boss Hugo Orange is great for the day time, it's a light fresh fruity scent which does need topping up through the day but it's worth it. 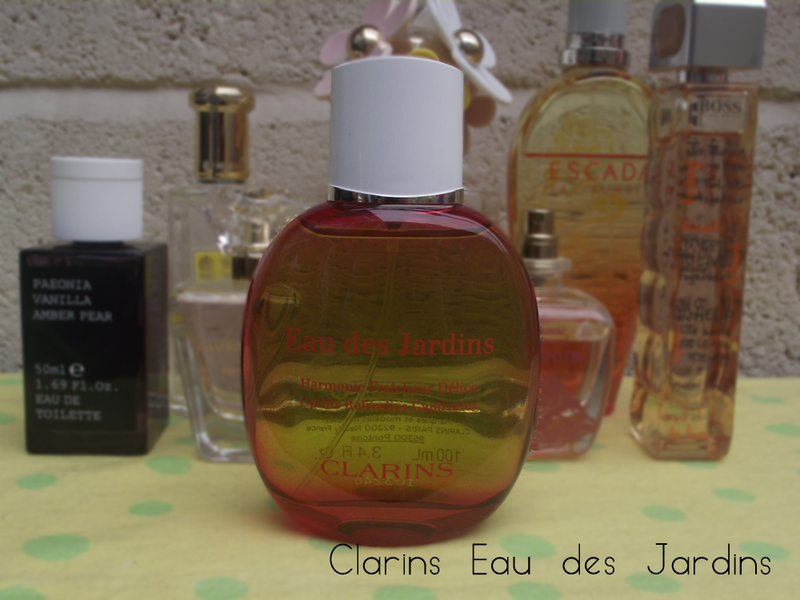 Clarins Eau des Jardins is packed full of great essential oils, this is more than a fragrance to me. It's a treatment which helps soothes the skin and uplifts the mind. 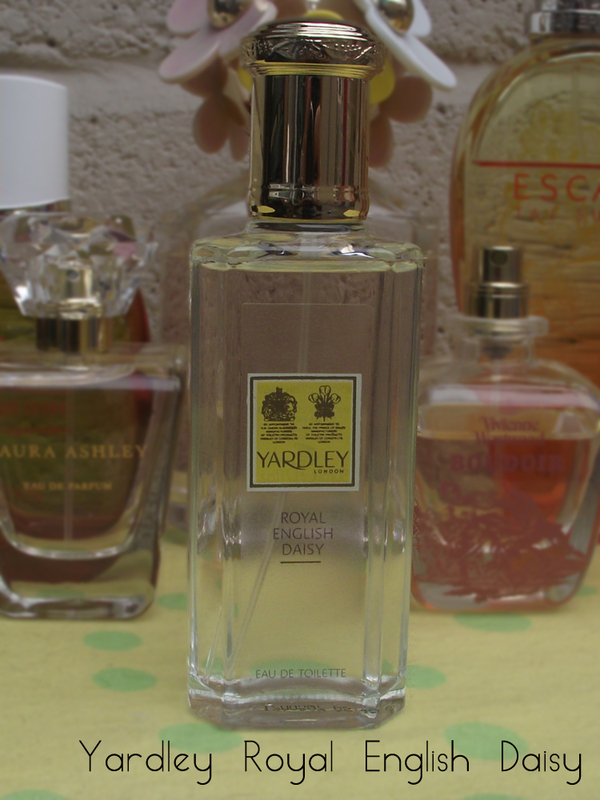 Yardley Royal English Daisy was a great discovery, once the perfume hit my wrist I instantly thought of Marc Jacobs Eau So Fresh! So if you can't part with the pennies or if you're a fan of the Marc Jacobs Daisy Eau So Fresh then trust me you NEED this! It has the same fruity-floral aroma. They both contain Green Leaves, Apple, Rose and Musk. 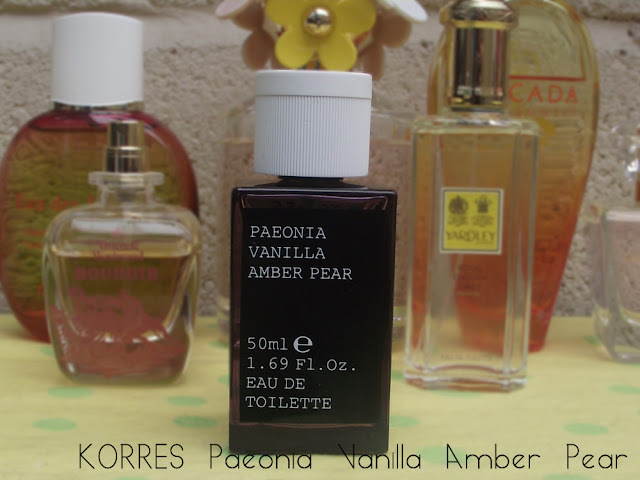 KORRES Paeonia/ Vanilla/ Amber Pear probably stands out most amongst all the clear light coloured bottles. I really like how different and traditional the bottle looks compared to others, KORRES is one of my favourite brands. Laura Ashley Pink Petals is a very soft floral feminine scent which smells of crushed rose petals, so if you're a rose devotee this would be perfect for you. It's not over powering and makes the perfect present for a friend or family member. 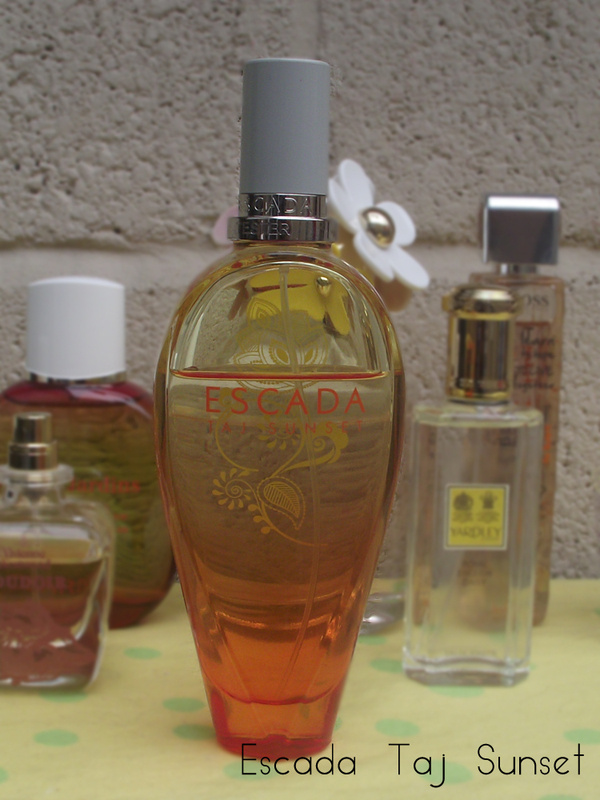 Escada Taj Sunset was sadly limited edition last year but I had to add this to my Summer Scents, I will keep this quick- LOVE LOVE LOVE this! I would love to know if you've tried any of these scents? 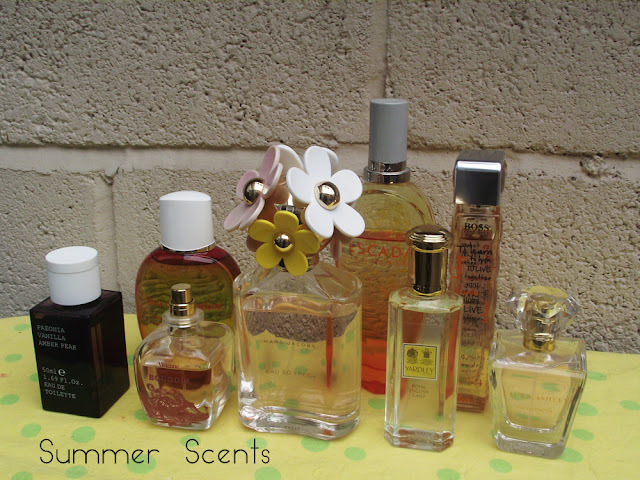 What's your Summer Scents? Love MJ & have wanted HB Orange for ages, gorge choices! Thanks for your comments ladies!